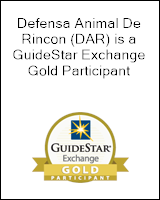 Defensa Animal de Rincon Puerto Rico is a Federal and Puerto Rico Non Profit Animal Rescue Organization. We are currently the only 501c3 on the Island that helps the unwanted street horses as well as dogs and cats. Our work and the situation for the homeless animals in Puerto Rico has been reported on by CNN Senior Writer and Editor Heather Long in "Puerto Rico has become ‘dead dog island‘", by Horse Nation's Standing Ovation , The El Coqui of Rincon 2015 Animal Rescue Article, 2016 Horse Class Article (2nd page) , 2017 Animal Rescue Article. and also in the The Documentary 100,000 The Movie. Find reviews of our work on our Defensa GreatNonProfits page! We are proud to be continusoulsy rated as a 'Top Rated' Puerto Rican Great Non Profits Organization. We are based out of Rincon Puerto Rico but we will help anyone anywhere in Puerto Rico rescue a dog, cat or horse if they can use our 'Open Rescue' or 'Hope4Horses' programs. We post our current months animal count & financial/PL around the 1st of every month on our Website DefensaRincon.org. We pride ourselves in being transparent in where your donations go. You will find our Puerto Rican Rescued Animals for adoption on our website as well as on, PetFinder, AllPaws and AdoptAPet. Please share us on Facebook, follow us on PoundWishes, Twitter and Instagram Social media is a great way to find rescued animals forever homes and bring in more donations. Our animals are FREE to the RIGHT home if their rescuer and Defensa approves your adoption application. This means, if you find an abandoned, neglected or abused animal we will help you keep the animal yourself or find the animal a forever family.